Know Your Limits: How Opportunity Can Outpace Wisdom - Veritas Communications Inc. I made some terrible choices that day. 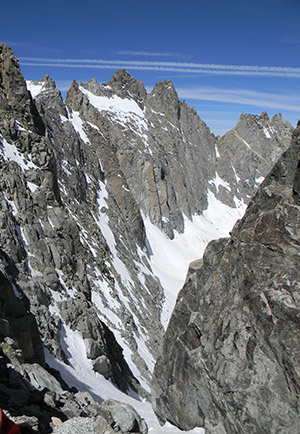 In my mid 20s at the time, I was eager to climb the North Palisade in the Eastern Sierra. At 14,242 feet, it stands as a worthy sentinel above other jagged peaks. It is not one to be taken lightly. I did. There is a fine line between pushing ourselves beyond what we believe we are capable and the wisdom to know when not to move forward. This is no less true for authors as for climbers. As writers, we are communicators so we believe our ideas should be heard. But how do you decide what to say no to when it seems like a great opportunity? I pushed forward until I reached the glacier below what’s called the U-Notch couloir and then strapped on my crampons. This is a steep snow-filled gully leading to within a couple hundred feet of the summit. Then, over difficult and exposed rock I scrambled summit. Simple, right? Now it was just a matter of getting back down. My first big error in judgment was to climb down too quickly and off the wrong side of the crest. I lost my climbing partner, lost my route, and ended up without water and food by late afternoon. By now the sun was starting to disappear in the western sky. For many of us, we think we are ready to tackle an opportunity when what we need to do is to be better prepared. This is true of interviews as well. Perhaps no one I know does this as well as Anne Paulk of The Restored Hope Network. She has learned, primarily because she has been burned by the media before, to say no to what most of us would say yes to. I have watched her turn down interviews because she either didn’t feel prepared for a topic or she didn’t trust the interviewer to be fair. That is wisdom. In spite of being exhausted from climbing along the Palisade Crest, I kept going. God saved me from the compounding of poor decision-making that day. I met two climbers from Riverside Search and Rescue and we rappelled down to safer ground . . . in the dark. It was a cold night at 13,000 feet with no food, no sleeping bag, and concern about my companion. At daybreak I returned to my own camp miles away and discovered my friend was safe. When we learn from our mistakes we become wiser people. I cringe at how many simple decision-making errors I made. As authors it is easy to get caught up in the thrill of the moment when it comes to media opportunities. We reason that “God must be in it.” We think that we just need to make ourselves available and God will bless us. I want to encourage you not to fall into this trap. Learn to say no when you need to. The late management expert, Peter Drucker, said our product should be “a changed human being.” Your job on media interviews is to help change lives, not just sell a book, gain a donor, or share your opinion. How do we know our limits when faced with opportunity? Here are a few thoughts. Focus on your expertise. What do you know? Focus on your strengths and learn to say no to opportunities that take you outside of these. Accept your weaknesses. Knowing what you are not good at is just as important as knowing what your expertise is. Hone your skills. Preparation, especially in speaking to disparate audiences, is crucial. Maybe you are great at communicating to Christian audiences but have never ventured beyond these. Don’t make the mistake of thinking you are ready just because you have an invitation. Keep your focus. A changed human being is what being a Christian author and communicator is all about. Condense your storyline. The tendency, especially with general market media, is to get sidetracked. Avoid this. Stay on topic. Keep within your realm of experience and expertise. Ask God for wisdom. He wants us to depend on Him for direction. He will give you discernment. My unplanned bivouac in the Eastern Sierra forced me to consider what I did wrong. Many climbers get “summit fever.” They become so focused on reaching the top they forget to make sound judgments and often never return. As Christian authors we must never allow opportunities to cloud our judgment.